Trying to get the factory A/C working again on my 70 Roadrunner. My compressor and condenser are in place but need photos of how all the lines are run in the engine bay. No correct replacements can be found anywhere so need to have them custom made. The shop manual has one diagram showing how they run but detailed photos would be the best way to get them correctly made as close as possible. Have not been able to find any photos doing a internet search showing the lines run as the shop manual shows. Have found some showing them run incorrectly like they are run on a 70 Charger (assume they ran into the same problem I am now and just went with the different way). Please PM me for my e-mail address to send the photos to unless your can post them as a reply to this post. Have you checked with Classic Auto Air or Vintage Air ? Have checked out both web sites and do not see any factory replacement under hood A/C lines on either site. have found a place that will "restore" existing lines but since my Roadrunner did not have any of those lines when I bought the car that will not do me nay good. Thanks so much for the photos but none of them show the discharge line from the compressor going over the driver's side inner fender.... All show the discharge line going back over the front of the motor to the condenser, not like the "figure" from the shop manual shows. 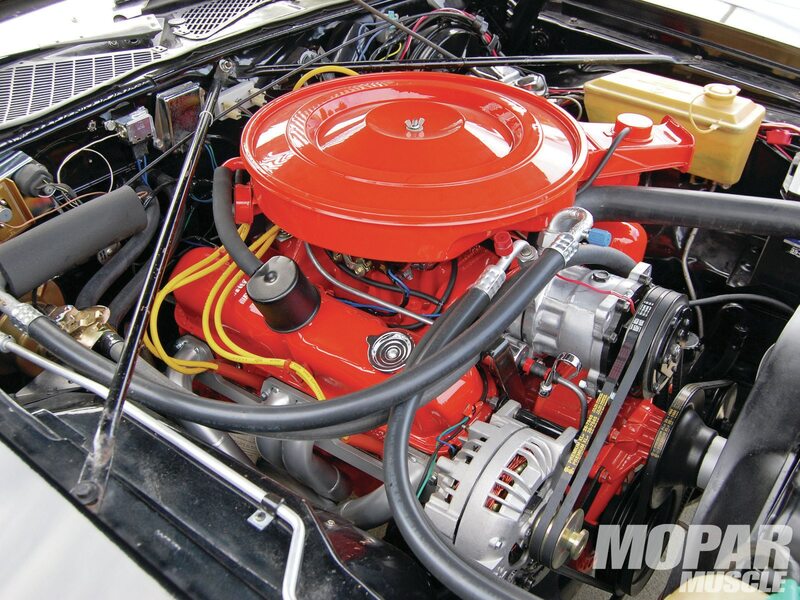 Question: Was it done two ways depending on what plant the 70 Plymouth was built? Sorry for all the questions...just trying to understand it all. Have seen other cases where different plants did the assemblies in different ways. I found this in my file. It's most likely a '69. I never noticed the metal tube crossing in front of the Rad. support before. Another one. Again, I don't know the year/model. I don't think this one is a b-body, but the style is the same. One good reason for not doing it this way is they're ugly! LOL! That is the "correct" way the discharge line is run for a 70 Plymouth B Body (according to the shop manual). I think is a "cleaner" looking way then having a discharge "hose" going over the front of the engine. Anyway thanks. I guess I will disagree. The discharge line on a 70 Plymouth Big Block 383, 440 & 426 hemi (according to the shop manual section 24 fig #15: Note: I am not aware of or heard of of any Hemi's built with A/C) is routed from the compressor over to the driver's side inner fender then goes along the upper front of the radiator support then connects to the condenser. On a 70 Dodge Big block (now I am going by the "original A/C parts I got from a Mopar buddy who took the system off a 70 Charger....I do not have access to a 70 Dodge shop manual to check on this) the discharge line is routed over the front of the motor then over to the condenser. Note: On a 70 Plymouth B Body with the 318 and the "6" (according to the 70 Plymouth shop manual) the discharge line is routed the same as a 70 Charger BB. So the "second" photo (gold colored Plymouth B Body) is "correct". The only thing that I can think of (and from my "limited" experiences with the Mopar "B: body cars) is "MAYBE" (and I have seen this before with other years of "B: body Mopars) different assembly plants did some things differently. As for this issue (the A/C discharge line routing over the front of the motor) no one has confirmed that this is the case. So why does the 70 Plymouth Shop manual show the discharge line going over to the driver's side inner fender? I have never seen a 1970 big block b body with the line to the drivers side, my assumption is the manual wasn't updated to the 70 lines as the previous years (66 to 69) big block b body lines do run to the drivers side inner fender.. I am assuming the photo of the "gold" car is a 70 Plymouth? 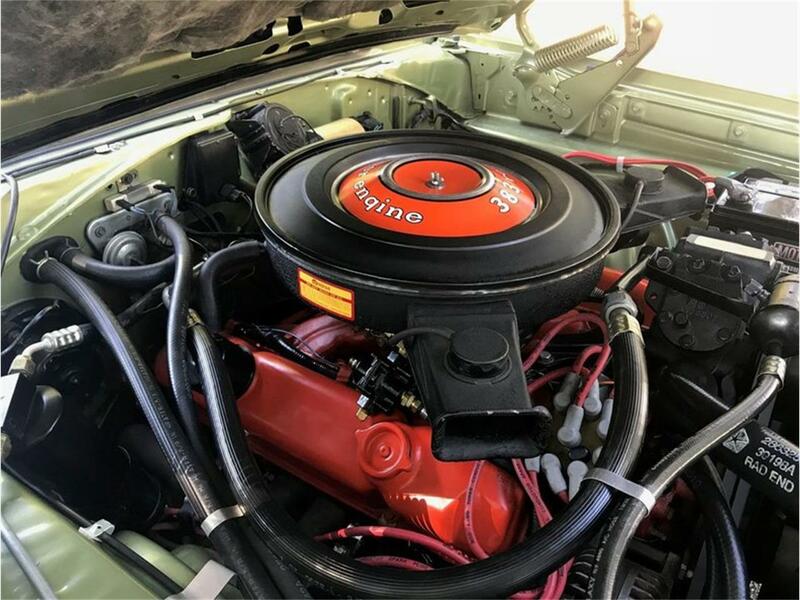 looks like mine (without the A/C lines in place......) but I am not an "expert".....have never seen another 70 Plymouth B Body BIg Block car with factory A/C. Added a photo of it.